This is an SCP jam-packed with some juicy weirdness, consisting primarily of an English translation of the graphic novel Adventures of Tintin: Flight 714. Just two pages of the book exhibit anomalous properties. When the book is opened up to page 21, it begins to generate humongous barnacles, three at a time, every three minutes in the general vicinity until the book is closed again. These "barnacles" are actually composed entirely of vertebrate bone, hair and other tissues. Each barnacle has differently colored hair along with white fur, one of them secretes whisky and each is genetically a mix between a different human and a wire haired terrier. Maybe you already know that this matches up with the main characters and pet of The Adventures of Tintin, or maybe you were able to hazard a guess simply because that's precisely the kind of thing we're used to here in the SCP Foundation. Meanwhile, every time the book is opened to page 58, character dialog changes to a bunch of quasi-gibberish that sounds sort of like an ongoing conversation between higher dimensional entities over the nature of existence. This is another of those points at which I think an SCP could have stopped and already gotten a big thumbs-up from me, but we're also treated to a heaping helping of backstory and a further explanation straight from the authors, which may be the point at which the SCP either makes enough sense to be cool or makes too much sense to be interesting, depending on your tastes. It turns out, see, that the book was recovered from the home of a struggling poet and artist extremely obsessed with Tintin and more than a little bitter towards a world that wouldn't recognize his genius. In a series of journal entries and text logs, we learn of his involvement in Are We Cool Yet, an in-universe underground art scene that works in the medium of the anomalous and sometimes acts as a loosely defined foil to the SCP Foundation. This, too, may either enhance or hamper your enjoyment of 2714 as an anomaly itself, but personally, I'm fine with tying it in to what is honestly a pretty cool concept. Of course the Foundation wouldn't be the only people aware of anomalies, and of course there'd be people who just want to cause chaos and make some kind of "statement" with them. According to the authors of this SCP, our poor artist is basically tricked into unleashing ancient cosmic entities into our world that must be channeled through written word, and of course selects one of his precious Tintin books for the ritual...but not too precious, no. Not one of his signed first editions in the original French. Unthinkable! 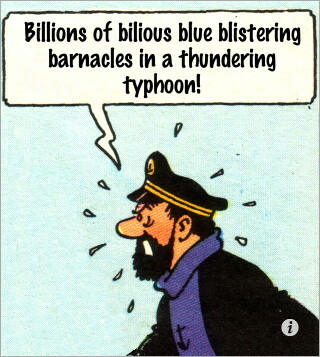 Instead, the Lovecraftian whatsits are summoned through a newer, English translation of a Tintin story, something he would have owned for pure completionism but valued relatively little, and this is why the result of the summoning is a bunch of mindless, messed-up barnacles; because the phrase "blistering barnacles" only exists in the English translations, which means these written words aren't the purest and truest they could be to the story they appear in, and the entities are now trapped within its pages incapable of manifesting functional forms. The best part of this is that, had the original French been used, the phrase would have been closer to "Cannons firing from Gunports".